Transform your school system or building with our energizing mix of participatory, whole-system initiatives that focus on strengths and build up trust. Inspire your people with customized presentations and workshops for conferences, convocations, and other site-based events. Sign up for coaching from one of our trained and certified professionals to improve your people skills and leadership effectiveness. Check out our growing library of best-selling books & resources, including Evoking Greatness, Evocative Coaching and Trust Matters. The Center for School Transformation Team are frequent attendees and presenters at many conferences throughout the year. See where we’ll be next – and while you’re there, VISIT US! EVOCATIVE COACHING CLASSES START SOON! Learn how to transform your school or organization, one conversation at a time. 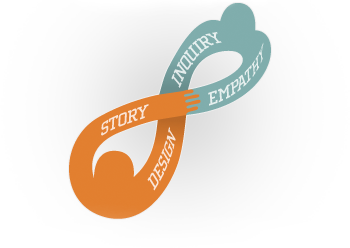 The conversational process of Evocative Coaching, Story–Empathy–Inquiry–Design, is portrayed on a Möbius Strip because of its expansive, iterative, and surprising qualities. At their best, coaching conversations are ever-deepening, mutually-satisfying, and uniquely-productive interactions between two or more people. When coaches learn to LEAD by Listening, Empathizing, Asking appreciative questions, and Designing strengths-based solutions, coaching relationships generate the motivation and movement people need to achieve desired outcomes and enhance their quality of life. The coaching process becomes transformational not only of the people involved but of the systems themselves. Come learn with us today! View an on-site training program in progress. Read what people are saying!